At age twelve, Jesus foresees his Messiah-ship. Do these events mirror what will happen at his trial before Pilate? In today’s Scriptures we move ahead from Christmas to later events. I decided not to talk about the Presentation of Jesus in the Temple, because we read it last year. Instead I want to discuss what happened when Jesus was twelve years old. At that time, he and his parents went to the Temple in Jerusalem to celebrate Passover. There is a joke that asks why Mary and Joseph took Jesus with them. The answer – they couldn’t get a baby-sitter. The joke seems reasonable from the perspective of 21st century parents. By law, Canadian parents cannot leave twelve year olds at home alone. But in the context of the 1st century, the answer is nonsensical. At twelve years old, Jesus was on the cusp of adulthood. That was why they took him with them because he was almost a man, not because they couldn’t leave him behind. 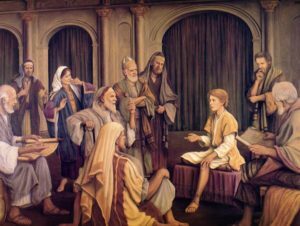 While they were in Jerusalem, the Temple scribes gave Jesus and his fellow twelve-year-olds instruction in the Law of Moses. That was to prepare them for their ceremonial entry into adulthood – today’s Bar Mitzvah – at age thirteen. But Jesus amazed everyone. He already knew the Law in detail. Today, the average Canadian lives for eighty years. It was closer to forty in Jesus’ day. If you waited till your thirties to marry and start a family, you had missed the boat! People died in childhood or because of illness and accidents. Adulthood had to begin much earlier in life. There was no concept of adolescence. Alexander the Great lived the same number of years as Jesus (33). He became king at the age of twenty. Ten years later he had the greatest empire in the ancient world. Jesus told his parents, “I was in my father’s house.” Jesus knew his future role in life by the age of thirteen. I found my vocation as a chemist at a similar age, even though I’m not Jesus or Alexander the Great. I was fourteen when I took my first high school chemistry course. The subject interested me so much that I finished reading the textbook in two weeks. ‘Helicopter parents’ didn’t exist when Jesus was a boy. Joseph and Mary didn’t worry that Jesus was not with them when they started home from Jerusalem. He was almost an adult, after all. The pilgrims from around Nazareth would have travelled to Jerusalem together. Joseph and Mary assumed that Jesus was with other people in the group. They didn’t realize that he was missing for a whole day. Then they began to worry because they couldn’t find him. They went back to Jerusalem to look for him. After three days they found him. He was sitting with the teachers in the Temple. The story is a very human one. By now, Mary and Joseph were frantic. When they found Jesus, their first reaction was to tear a strip off him. “What do you mean, staying behind like this? Your father and I were worried stiff!” And the almost teenager Jesus replied equally in character, “What are you all worked up about? Surely you realize that I was here, learning in my Father’s house!” I guess that parents were a just as much of a pain in teenagers’ necks two thousand years ago as they are today. I have to make a side comment here because I especially noted what Mary said. “Your father and I have been worried about you.” Miraculous birth or no miraculous birth, Joseph was definitely Jesus’ father from Mary’s point of view. In the same way, I am very touched and affirmed because Robin calls Michelle and me “my parents”. I am not Robin’s biological father because Robin’s father Ralph died when he was eight. Now we read that Jesus told his parents, “I must be in my Father’s house.” In those words, Jesus acknowledged his divine vocation. Yet again, Luke stresses Jesus’ divine character. Is this just a plain story with a surface meaning, or is there symbolic stuff underneath, like a parable? 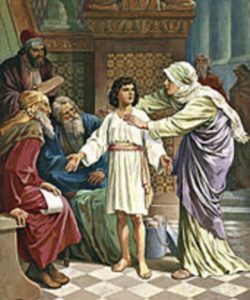 At age twelve, before Jesus started his ministry, he amazed the scribes were amazed because he understood the Law so well. Mary and Joseph did not understand what Jesus said to them. At the very end of his life, when his earthly ministry was over, Jesus also went to Jerusalem for Passover. Like the Temple scribes who were “amazed” at the knowledge of twelve year old Jesus, so Pilate will be amazed at the way that Jesus answers or does not answer his questions. Twelve year old Jesus was lost for three days. That is the same time as between the Crucifixion and the Resurrection. I wonder whether this is part of Luke’s use of “book-ends” in his narrative. Luke’s Gospel (alone of the four) begins and ends with events in Jerusalem. But I do not know whether i was Luke’s intention to mirror the journeys to Jerusalem at the beginning and the end of Jesus’ life. In my reading this week, I did not find any insight about what other authors have written on this subject. So I will leave this as something that I cannot resolve. That’s too bad if you think that I have all the answers.